MEDWAY — Superintendent Armand Pires is pleased to report that a school based food pantry will open at Burke-Memorial Elementary School this spring. This past summer, Medway Public School officials partnered with representatives of the YMCA and the Medway Village Church Food Pantry to discuss how they could create a program that would supply students in need with food for the weekend. The YMCA has partnered with other local schools to create similar programs to send students home with food. After applying to Stop and Shop for a grant to support a school based food pantry program, the district was awarded $1,600 this January. The funding from Stop and Shop will allow the school to build shelves, purchase backpacks, and buy food for the new program. The optional program will start by serving a group of 15 students. Those students will be among 50 to 70 children who are eligible for free and reduced lunches at the school. The backpacks will include simple foods students can eat on their own, like granola bars and apple sauce, as well as meals they can prepare with an adult, like a pasta dinner. Those interested in donating food items to support the new program can do so by leaving bags marked “Food Pantry” at the church office of Medway Village Church at 170 Village St.
ROCHESTER — A partnership between the Rochester School Department and the YMCA of Strafford County, a branch of The Granite YMCA, will bring a site-based learning center to Rochester Middle School in the upcoming school year. Thanks to a generous five year grant received from the NH State Department of Education, a 21st Century Learning Center will launch in the 2017/2018 school year. This six week program emphasizing leadership, character development, and academic support will run daily out of the Rochester Middle School from 2:30 – 5:30 p.m. Serving up to 50 students per week, The 21st Century Learning Center has the potential to impact and serve over 150 students over the course of a year. A full day summer component will also be available to approximately 25 students for a four week period. Summer participants will engage in academic activities in the morning and will then be bussed to YMCA Camp Coney Pine for outside camp activities in the afternoon. The 21st Century Program will be broken out into three concentration areas: academics to provide students with homework help, tutoring, and project follow through; enrichment activities which will be offered in response to the expressed interested of the students featuring First Aid and CPR training, photography, cooking, and more; and wellness and recreation where students will enjoy physical fitness activities including yoga, martial arts, snowshoeing, soccer, and archery to name a few. “One of the many wonderful aspects of this program is that we enable students to find their voice and discover new interests,” said Rachelle Hennessy, Associate Branch Director at the YMCA of Strafford County. Students participate in enrichment activities by selecting five options, one for each day of the week, which will then be offered for the full six-week cycle. Hennessy added that the 21st Century Program not only benefits the students, but also the community as a whole. The large offering of enrichment activity options coupled with mentoring and tutoring allows for further collaboration with local business owners, other non-profits and organizations as well as community volunteers and even AmeriCorps/Vista recruitment opportunities. For more information, please contact Rochester Middle School Principal Adam Houghton at 603-332-4090 or via email at houghton.a@rochesterschools.com or Rachelle Hennessy at the YMCA of Strafford County at 603.332.7334 or via email at [email protected]. Located in the heart of New Hampshire, the Rochester Public School district is home to the following schools: Spaulding High School, Rochester Middle School, Chamberlain Street School, East Rochester School, Gonic School, Maple Street Magnet School, McClelland School, Nancy Loud School, School Street School, William Allen School, and Bud Carlson Academy. The district strives to offer students a broad scope of educational experiences and opportunities. As one of the state’s longest standing and most enduring non-profits, The Granite YMCA focuses on youth development, healthy living, social responsibility, and family strengthening. Across the state, its six branches engage 30,000 men, women and children – regardless of age, income or background – to improve their health and well-being, and provide opportunities to give back and support neighbors. In 2016, The Granite YMCA provided financial assistance and free services valued at over $1.63 million to 19,872 individuals. To learn more, please visit www.graniteymca.org. Camp Burbank children and their families pose with Reading police officers at the cookout (Courtesy Photo). The framed picture given to the Reading Police Department by Camp Burbank (Courtesy Photo). A Camp Burbank family talks with a Reading police officer at the cookout (Courtesy Photo). Fuddrucker’s catered the YMCA-sponsored cookout (Courtesy Photo). Each officer received a goodie bag filled with candy fit for police officers (Courtesy Photo). READING — Chief Mark D. Segalla is pleased to announce that the children and families of YMCA Camp Burbank hosted a cookout for members of the Reading Police Department to thank them for their service. Approximately 20 Reading Police Officers and 55 campers and family members attended the cookout, which was held at the local YMCA on Aug. 3. Each family “supported” an officer, paying for their meal, which catered by Fuddruckers, and eating dinner together. They also gifted a framed picture to the department that included fingerprints from all involved campers. 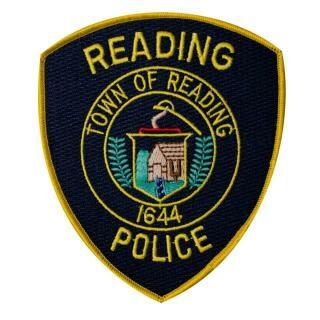 The Reading Police Department would like to thank all the campers and families who attended the cookout, Fuddruckers for catering the event, as well as the YMCA employees who organized it: Laura Auriti, MaryAnn Hanafin, Claire McNally, Hayley Yaffe and Gina Colarusso.